Have a busy schedule during the summer, but would still like your children to learn how to swim, the right way? Excel Aquatics is proud to offer the Our School at Your Pool program! In this private lesson program, we send one of our experienced swim instructors to teach your children how to swim in the privacy of your home pool. 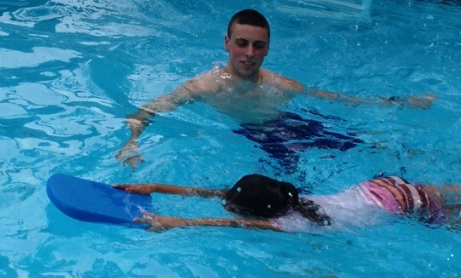 At home swim lessons are 30 minutes in length, and are scheduled on a per class basis. Our instructors travel to your home pool, which means no more driving to or from lessons; you save time, gas, and enjoy the convenience of having one of our instructors come to you and teach private swimming lessons at home. You choose the available lesson times that work around your busy schedule. are CPR/Lifeguard certified, and are liability insured. With class sizes ranging from Private (1 student) to Group (3 students), class lessons are personalized to fit the needs of the swimmers. This means faster progress and a more effective learning environment. Student to instructor ratio is 1:1. Price is $50 per class. Student to instructor ratio is 2:1. Price is $60 per class ($30 per student). Student to instructor ratio is 3:1. Price is $75 per class ($25 per student). Interested in Our School at Your Pool? Send us a message today!